An extensive account, Diego Laínez (1512-1565) and His Generalate, has been published by Institutum Historicum Societatis Iesu (IHSI). Paul Oberholzer S.J. edits the multi-volume examination of the “Jesuit with Jewish Roots, Close Confidant of Ignatius of Loyola, [and] Preeminent Theologian of the Council of Trent.” Adolfo Nicolas, the sitting superior general, offers some introductory remarks. In all, essays consider Laínez’s personality and ministry, his political and social milieu, his works and networks, Catholic reform, his culture and education, and “The New World.” Available online, at the IHSI website, are the book’s table of contents and Oberholzer’s introduction. 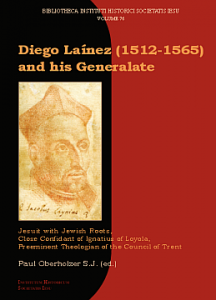 Update: The Journal of Jesuit Studies has reviewed Diego Laínez (1512-1565) and His Generalate (Volume 3, Issue 4).